Stow away your plain 'ol brown juttis, folks. The Haelli’s got some super colourful and quirky hand-painted ones that are going to steal your hearts. 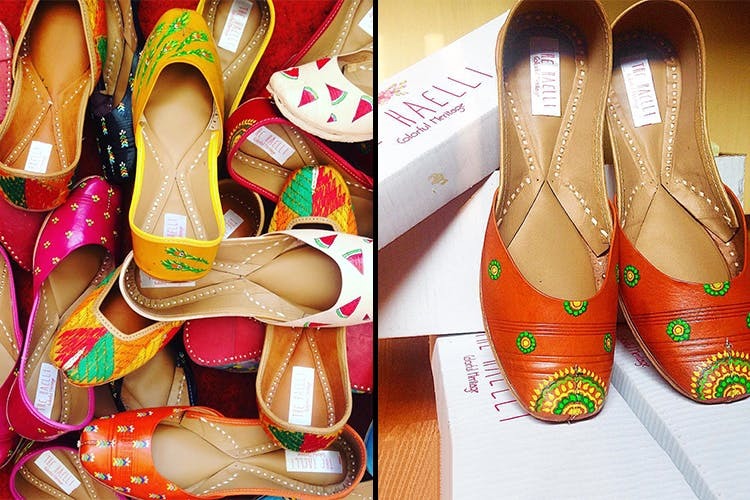 The Haelli is a venture by Neha Sahu, an art enthusiast with a strong love for juttis. She combines these two passions to create juttis made of leather which are then hand-painted in the most vibrant shades. Purple, yellow, orange, turquoise, pink, green, black—there’s no dearth of colours here. But the real show-stoppers are the painted motifs. Watermelons, baby elephants, pandas, unicorns, ladybirds, flowers—they’ve gone all out on the quirk, and the results are spectacular. If you want to add some funk to your footwear rack, you should definitely take a look at The Haelli. Their cute panda and unicorn motif juttis look great when worn with a pair jeans and a white top. You can even pair them with an anarkali for a snazzy day-wedding look. We've loved how all their juttis stand out in terms of colour and design, which can go well with a modern or even an ethnic look. While the juttis stand out in terms of their style quotient, we hope to see different hues and patterns, along with the prices being slightly lower.